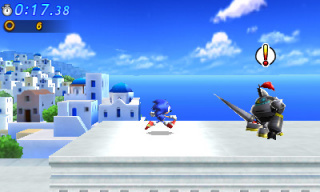 Water Palace is the sixth level in the Nintendo 3DS version of Sonic Generations, and an adaptation of the level Water Palace from Sonic Rush, and the only level in all of Sonic Generations that was exclusive to a handheld title. Classic Sonic had nods to classic underwater levels from the past, while Modern takes it the same way as in the original with high speed water running and water slides. The enemies featured in this level include Knight Pawns, Klagens and Sea Pawns. The Classic Act is practically almost all water, with some land parts that feature the water cannons from Sonic Rush Adventure's Pirates' Island, along with a new bubble gimmick that allows Sonic to reach greater heights. The water pumps in this Act require Sonic to press buttons to activate them. Near the end of the Act, a giant Sea Pawn will pursue Sonic through an underwater passageway and tear through the walls in an attempt to stop him. The Modern Act is played much like the level's original appearance in Sonic Rush, including water slides for Sonic to slide down, sea mines to hitch a ride on, and crates to stomp through to proceed. Sonic is also capable of running on the water by boosting to reach higher routes above water. This page was last edited on 19 September 2018, at 11:45.